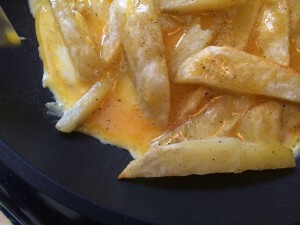 When I was very little, I refused to eat eggs in any form, even if the eggs were nestled among crispy golden french fries. Silly, I know. 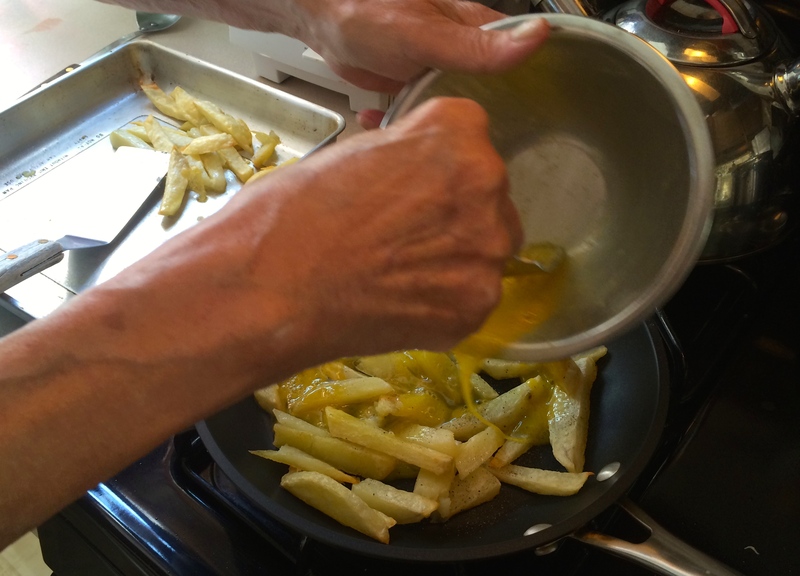 Always ahead of her time, Yiayia realized that she just needed to ‘rebrand’ Patates me Avga in order for me to give it a try. She renamed it σκοτάδι, which means ‘darkness’, not because it describes the food in any way, but because it defined my state of awareness while eating this dish. Yiayia was a wise woman. Her trick worked like a charm and I would routinely devour Patates me Avga while blindly clinging to the belief that I did not eat eggs. I’m not sure if the moral of this story is if you add french fries to anything, you can get a kid to eat it? Or…lying to kids is good sometimes? Or… I wasn’t the smartest Greek kid on the block? Either way I’m so glad she tricked me because this dish is a keeper. 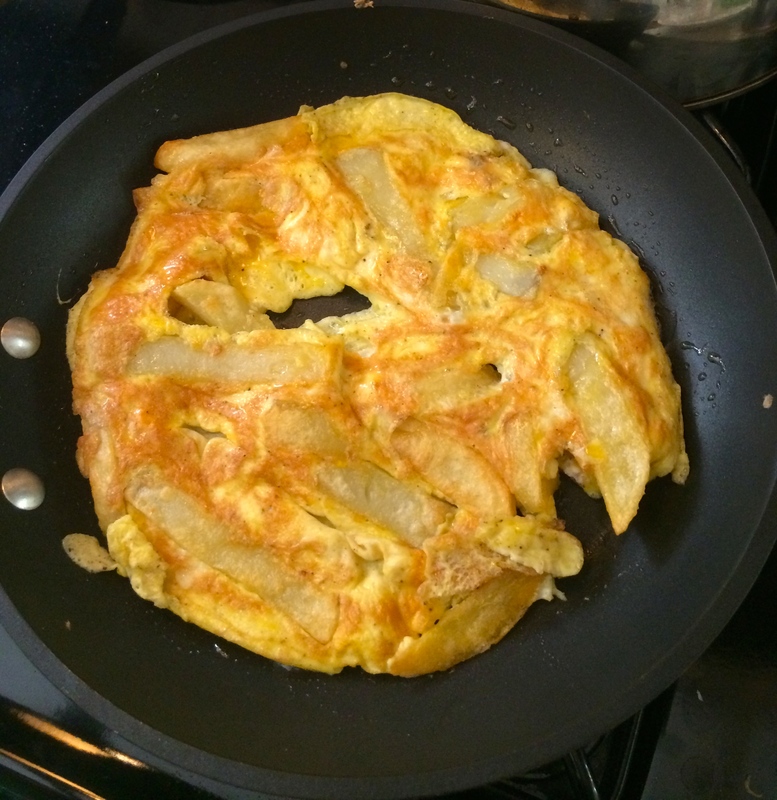 French fries and eggs…it doesn’t get any simpler and there are few things more satisfying. 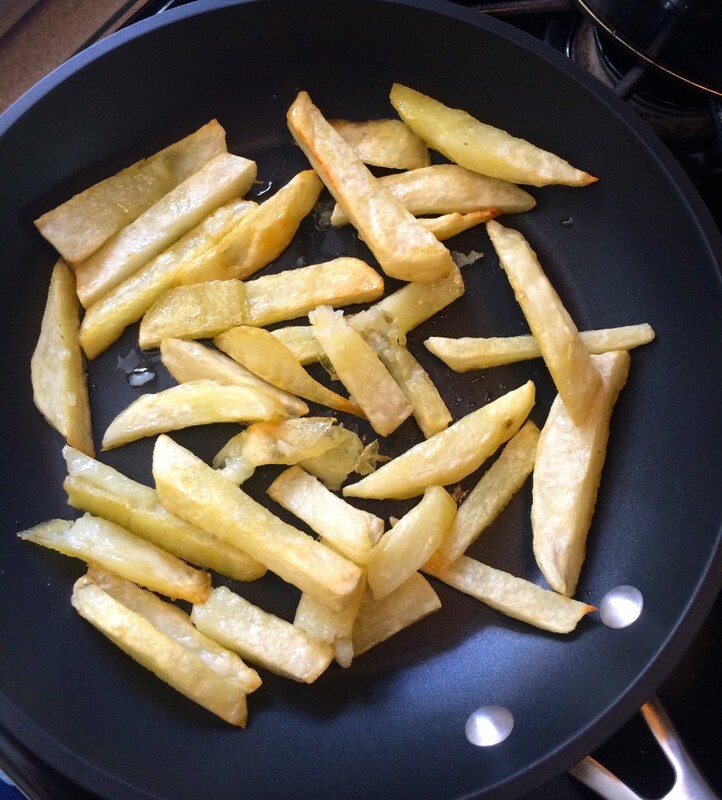 All you will need is a potato, 2 eggs, olive oil, salt & pepper. 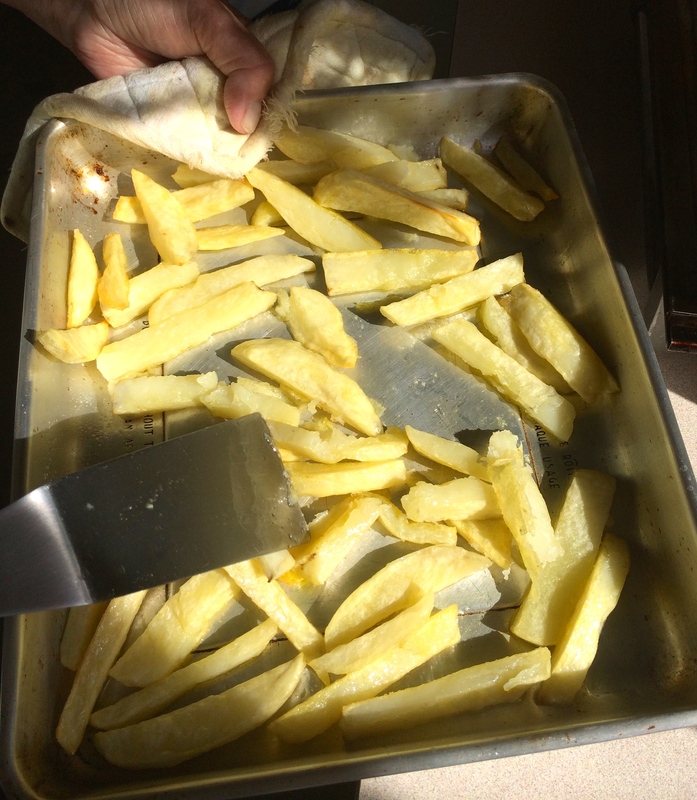 Peel and slice the potato to make the french fries. You can fry them in hot oil, or you can do as we did here and bake them at 450 degrees for 30 minutes. If you bake them, drizzle first with olive oil and sprinkle with salt. Turn the potatoes half way through the cooking time so they cook evenly and don’t stick to the pan. Transfer the cooked french fries to a large non-stick skillet over low heat. No need to add extra oil. In a small bowl add 2 eggs, salt and pepper. 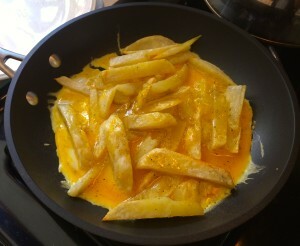 Beat the eggs well and pour over the french fries. Let the eggs cook slowly over low heat until they are set on the bottom. Use a spatula to flip the potato & eggs over to cook the other side. When the eggs are cooked to your desired doneness, transfer to a plate. If you are an Americanaki, you might enjoy a little ketchup on the side. Perfection. Peel and slice the potato to make the french fries. You can fry them in hot oil, or you bake them at 450 degrees for about 30 minutes. If you bake them, drizzle them first with olive oil and sprinkle with salt. Turn the potatoes half way through the cooking time so they cook evenly and don’t stick to the pan. 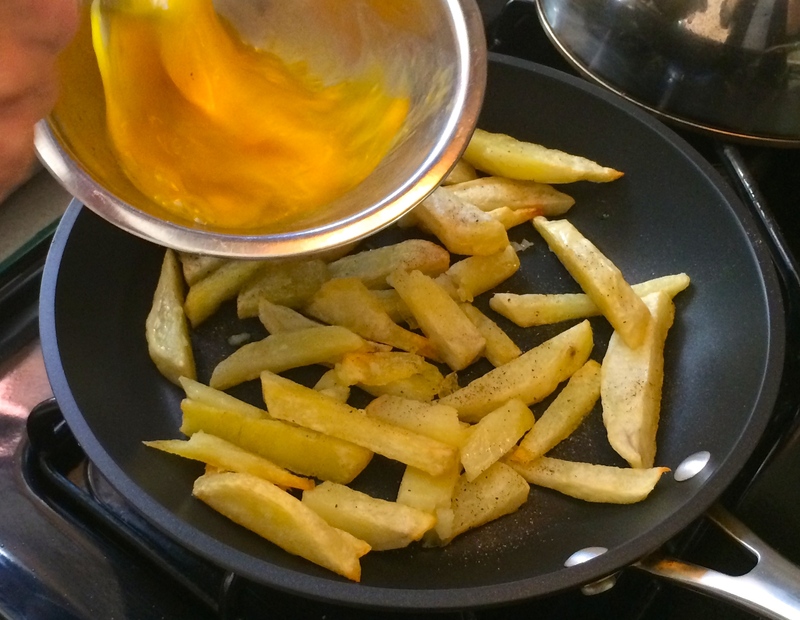 Transfer the cooked french fries to a large non-stick skillet over low heat. No need to add extra oil. 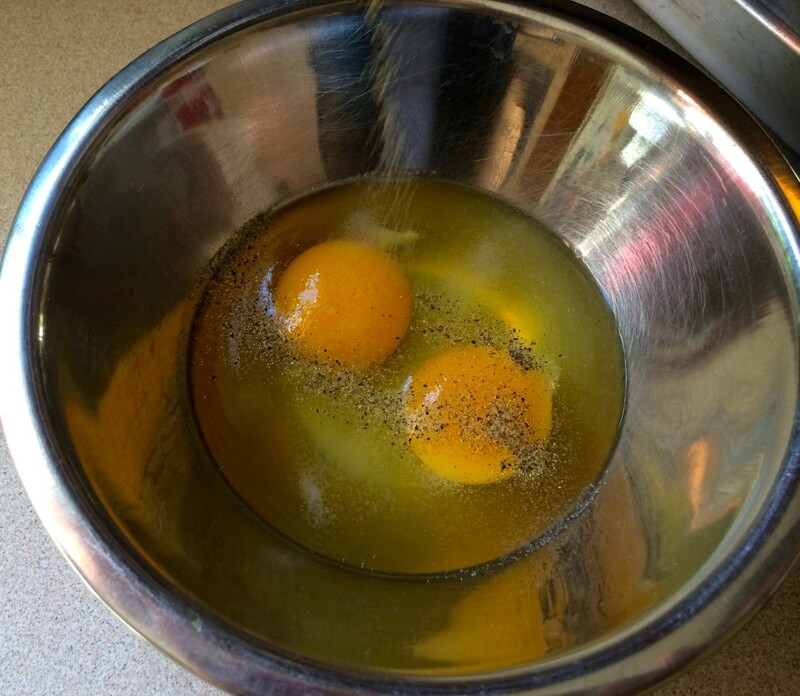 In a small bowl combine eggs, salt and pepper. Beat well and pour over the french fries. Let the eggs cook slowly over low heat until they are set on the bottom. 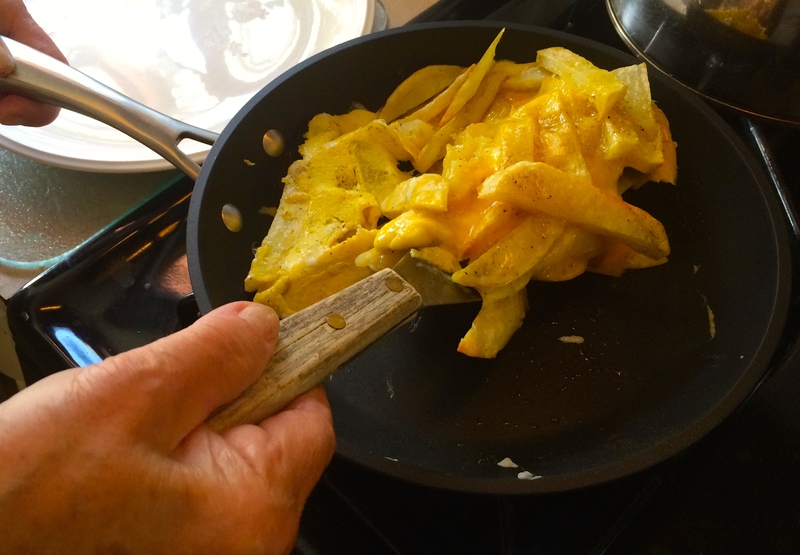 Use a spatula to flip the potato & eggs over to cook the other side. 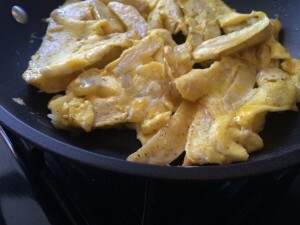 When the eggs are cooked to your desired doneness, transfer to a plate. 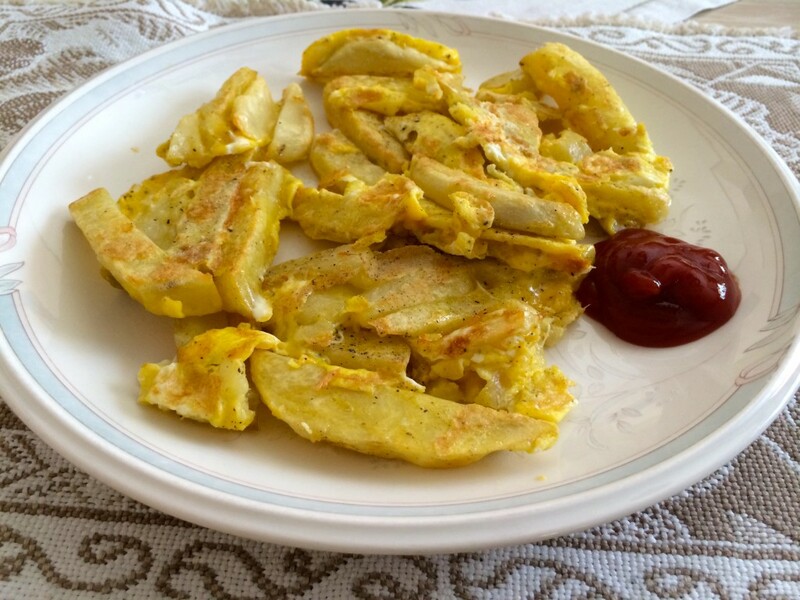 This entry was posted in Lunch, Vegetarian on October 23, 2014 by cousins.